Domino printhead solenoid valve is specially owned by Domino printer. It is open when the CIJ printer is working, and closed when the CIJ printer is shut down, which will reduce the possibility of any blockings in Domino nozzle. What's more, Domino CIJ printer's particular twice automatic self cleaning procedure adequately guarantee the machine can be started up normally each time. The printhead solenoid valve is made of coil, valve element and pull rod. Normally the coil and valve element won't be damaged. 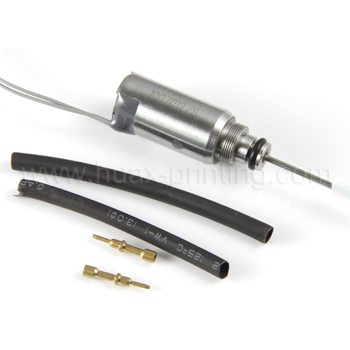 Only the rubber head of the pull rod will be worn out as the service time goes by, which will cause skew lines of ink. Or sometimes, the rubber head may even fall off, which is hard to repair, and have to change the whole printhead solenoid valve. How to change Domino printhead solenoid valve? Step 9: Start up and shut down the machine for times to see whether the spraying out and stop of ink line is normal. Note: Above steps require the operator with high operational capacity on Domino printer, thus Huax Tech suggest that above process should be carried out by professional engineers. More information on CIJ printer technology, please feel free to contact with us.